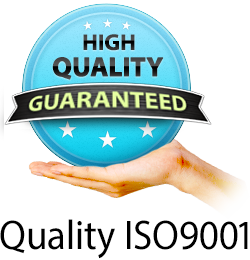 ISO9001 international certification is proof of stable production and satisfactory service. As a company that manufactures high-quality electric products, ISHIDA has obtained certification from JAB, which has the strictest certification conditions in Japan, and UKAS, a certifying institution in Great Britain. 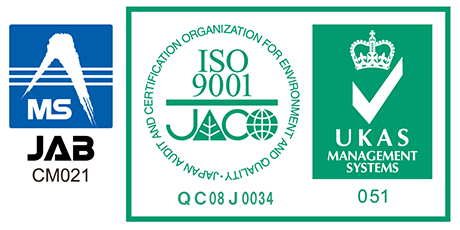 In August 2008, the ISHIDA plant in Kiryu obtained ISO9001 international certification for the Quality Management System under which all of our products are made. As a company that manufactures high-quality electric products, ISHIDA has obtained certification from JAB, which has the strictest conditions in Japan, and UKAS, a certifying institution in Great Britain. In August 2008, the ISHIDA plant in Kiryu obtained ISO9001 international certification for its Quality Management System under which all of its products are made. ISO9001 certification is given to quality systems covering all product stages: design and development, production, sales and after-sales service. In particular, certification covers electric devices audited for safety and reliability. The ISO9001 rating is recognition of ISHIDA's quality assurance system as a manufacturer of electric motors. In the 21st century, businesses are being called to focus on preservation of the natural environment. Efforts to reduce the industrial burden on the environment have become conditions for transactions and investment. ISHIDA is aiming to obtain ISO14000 certification, proof of consideration for the environment beginning with the product design stage. By doing this we will achieve both energy efficiency and minimal waste.